Money matters? Perspectives on Monetary Policy: Is the ECB a central bank overburdened with risk? The short answer is: yes, but not of the kind you think. The long answer starts by noting that in some quarters the financial risk coming from unconventional monetary policies is advanced as a reason for more caution (or cowardice?). For instance, the Bundesbank in the document on the OMT presented to the German Constitutional Federal Court gave quite some weight to this issue . It is, of course, true that the Eurosystem (I freely use the term Eurosystem and ECB as synonymous) has taken up much more risk (as traditionally measured, see below) during the crisis. A balance sheet which grew by a factor between 2 and 2.5, the lower average creditworthiness of euro area banks, the overall lesser quality of the collateral taken as guarantee necessarily bring more risk on the balance sheet of the Eurosystem. But this obvious remark is the beginning, not the end of a considerate discussion of the financial risk of the ECB. Indeed such discussion must take into account two considerations that fully justify the additional risk taken by the ECB. The first consideration, of a financial nature, is that the Eurosystem has been endowed (I am tempted to say "by the people of Europe") with a very large buffer that allows it to take quite some risk on its balance sheet. The table below reports the best estimate of the accounting measurement of the difference between the value of the assets and the liabilities of the Eurosystem: what one can define as the “broad equity” of the central bank. There one sees that at, more than half a trillion euro, this is very large even if compared to a swollen balance sheet of 3 (on 2nd of March) trillion euro. Add to this that in all occasions in which the ECB intervened in the market it made profits: when it bought euros against dollars at the turn of 2000, as one euro bought only 82 cents of a dollar, when it bought, starting in June 2009, covered bonds whose spreads had gone far beyond any fundamental based level, when it bought sovereign bonds of peripheral jurisdictions in the Securities Market Program starting in May 2010 . The second consideration is of institutional nature and more important. This is that one of the fundamental functions of a central bank is exactly to absorb the risk that explodes in a crisis and that no private institution could bear. This is a reflection of the fact, which the Great Recession again forced us to recognise, that market economies are wonderfully efficient machines but, probably just because of their sophistication, prone to instability, which sometimes develops into a fully fledged crisis. Central banks are one of the inventions to manage this instability, ex-ante trying to make it less frequent and less intense, ex-post attenuating its impact on the economy. The importance of the last six words of the preceding sentence cannot be overstated: if the central bank “attenuates the impact of the crisis on the economy” it means that it cannot be considered a small agent that has to take financial conditions (prices and quantities) as given. The central bank influences the economy with its action and the traditional risk management approach, which instead takes financial conditions as exogenous, cannot be applied to it  . This is exactly the point made by that early but still full of insights student of central banks: Bagehot. He wrote back in 1873  : “..making no loans as we have seen will ruin it [Bank of England]; making large loans and stopping, as we have also seen, will ruin it. The only safe plan for the Bank is the brave plan, to lend in a panic on every kind of current security, or every sort on which money is ordinarily and usually lent. This policy may not save the Bank; but if it does not, nothing will save it.” So, he says, apparently taking more risk (lending freely and bravely) is the way to take less risk, because the action of the central bank changes financial conditions. Applied to the current situation, what would have happened to the risk of the Eurosystem if it had not had recourse to its non-standard measures? So financial risk (traditionally defined) has to be taken by the central bank in a crisis and this will eventually mean taking less risk in a more fundamental sense. This does not justify a cavalier attitude towards risk but should not be invoked to stop the central bank doing what it has to do to manage the crisis. But then, if it is not financial risk what is the risk that is overburdening the European Central Bank? 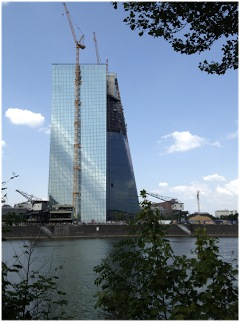 A look at the new building of the ECB helps us start answering this question. This building was planned before the ECB was given the task to also carry out supervision, and thus, beautiful as it is, it just can not accommodate the about 1.000 additional employees that are needed for the new task. Indeed, one suspects that, with doubtful wisdom, the governors of the national central banks sitting in the Governing Council sized the building very conservatively in the hope to contain the growth of the ECB and thus maintain more prerogatives for their national central banks.Be that as it may, the ECB will need to find a different building for its new employees. But this will be a tiny part of the difficulty of absolving its new responsibility as supervisor. As Nicolas Veron aptly said in a Bruegel Policy Contribution, the ECB will have two challenges in becoming the euro area supervisor: one will be difficult, the other will be fiendishly difficult and they together constitute the real risk for the ECB. The difficult challenge is to hire the new people, amalgamate them into the ECB and prepare them to take the new euro area responsibilities forgetting about any national allegiance, master the supervisors intellectual paradigm, which is very different from that of monetary policy, work with a complex decision making, which a Supervisory Board and the Governing Council of the ECB will have to share. The fiendishly difficult challenge is not to succumb to the calls of forbearance that are likely to come strong and aggressive from national supervisors. These calls already spoiled the previous stress tests and arguably contribute to prolonging the European crisis, not cleaning up the euro area banking system of its weak parts and allowing a veil of suspicion covering all of it. The first tests for the ECB will be the Asset Quality Review and then the Stress Test that will have the fundamental role of clarifying what are the responsibilities of the old supervisors and those of the ECB, what are “legacy losses”, in the terminology of Veron, and what will be the new losses, what has to be covered nationally and where Europe could help. Of course a strict approach in assessing the balance sheets of the euro area banks has to be matched by clarity about the back-stop and resolution modalities. But any problem in the latter should not justify the additional problem that would derive from a bland assessment of the state of health of euro area banks. In conclusion, the overburdening risk for the ECB is not the financial one sitting in its balance sheet but the one about credibility: the ECB was chosen to do supervision because it has earned its credibility in carrying out monetary policy but could lose that credibility, with immeasurable damage, if in carrying out its new function it would cede to the calls to close an eye to the weaknesses it would find in euro area banks. “…, unterschieden sich die Staatsanleihekäufe anderer Zentralbanken von denen des Eurosystems dadurch, dass durch das Eurosystem gezielt Anleihen schlechterer Bonität erworben werden und somit die Bilanzrisiken deutlich höher sind. “(Page 16 of Bundesbank document) “Dies führt dazu, dass Risiken aus Operationen resultieren, durch die Zentralbankliquidität geschaffen wird, den durch die beschriebene Erweiterung der Sicherheitenliste werden höhere Ausfallrisiken für diese Sicherheiten in Kauf genommen. Trotz erhöhter Sicherheitsabschläge ist dadurch gegebenenfalls nicht mehr sichergestellt, dass Verluste voll aufgefangen werden können. (page 26). In Section D.II.1 and D.II.2 the cases of losses (Verlust) of the ECB or National Central Banks are mentioned. With Carlos de Sousa we have estimated, on the basis of data recently published by the ECB, that the value of the securities it bought increased by 14 billion euros since the purchase date (Click here to display the paper). I owe this point and the quotation from Bagehot to past conversations with Ulrich Bindseil. Thanks Francesco for sharing your thoughts. On the financial risk. I agree it is not a major concern, with a caveat. The central bank is the only entity that can manage what I call systemic liquidity risk, especially the funding element of liquidity risk. When it comes to systemic credit risk, you need a government behind the central bank, like in the US where the Treasury is always backing the Fed, in contrast to the European situation. This is why it has been fundamental to set up the European Stability Mechanism with government money, and this is why it is ultimately essential to move to a UE treasury to properly manage macroeconomic imbalances that are closer to systemic credit risk issues. On the credibility issue. I am less concerned for a major reason but with one caveat. The reason being that if one had experienced the high level of fragmentation of supervision, the unlevel playing field in supervisory practices and the cooperation ineffectiveness in many EU countries, this person/institution would be definitely confident that a European level is very much likely to address the fatal flaws that have characterized the current regime in crisis management and resolution. On the other hand, I see the credibility issue in the composition of the Supervisory Board, which remains too much skewed to the clear majority of national representatives, albeit to a much lesser extent than the European Supervisory Authorities and the ESRB, where the national side is overwhelming.